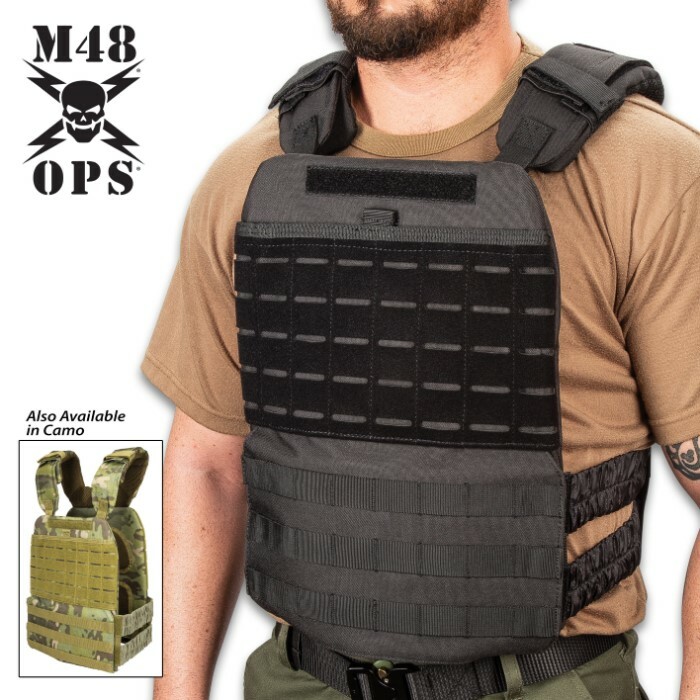 M48 Laser Cut Tactical Plate Carrier Vest - 600D Oxford Material, Inside Padding, MOLLE Webbing, One-Size Fits All | BUDK.com - Knives & Swords At The Lowest Prices! The M48 Laser Cut Tactical Plate Carrier Vest is engineered to provide you with the most effective and efficient means to wear your ballistic plates (not included), so that you can rest assured that they are positioned just right to save your life, if need be. The vest is constructed of heavy-duty 600D Oxford material with a water-resistant coating and has comfortable padding on the inside and underneath the shoulders. It is laser cut on both front and back and also features MOLLE webbing on both front and back panels, giving you an organized way to attach other gear, and it has a grip-and-go handle. Compartments on both the front and back of the vest hold the ballistic plates (not included) tightly in place, perfectly positioned, with strong Velcro panels. The completely adjustable Velcro closure straps on the sides and at the shoulders makes this vest one-size fits all and it’s available in black and camouflage.